The Vancouver Canucks’ season is officially over, but that doesn’t mean there isn’t action surrounding the team. The NHL Draft is looming and a number of awards will be given to honor players whose accomplishments were notable during the regular season. In addition, the Canucks are on the verge of history: they will celebrate the team’s 50th anniversary as a franchise in the National Hockey League. Here’s some of the recent news about the team. Item One: Will Pettersson Win the Calder? In his April 10 “31 Thoughts” post, Sportsnet’s Elliotte Friedman broke down the NHL’s major awards races. There’s no surprise that the Canucks’ Elias Pettersson was front and center in discussions about who would win the Calder Trophy. For Friedman, a number of players were under consideration for the Calder. These included center Anthony Cirelli (Tampa Bay Lightning), defenseman Rasmus Dahlin (Buffalo Sabres), goalie Carter Hart (Philadelphia Flyers), right winger Andrei Svechnikov (Carolina Hurricanes), and left winger Brady Tkachuk (Ottawa Senators). However, as Friedman sees, the real choice was between goalie Jordan Binnington (St. Louis Blues), defenseman Miro Heiskanen (Dallas Stars), and the Canucks’ young center Pettersson. Friedman thinks Heiskanen is disadvantaged because he doesn’t play in a Canadian market, although he had an impressive season and has steadied the Stars’ rear guard. Friedman also recalled the debate three years ago when Connor McDavid’s injury limited the number of games he was able to play (45), which caused McDavid to lose the award. That thinking rules Binnington out because he has only played 32 games. However, Binnington’s impact on the Blues’ season was incredible. As Friedman noted, his play saved people’s jobs and gave the Blues’ management increased space to make thoughtful decisions about the team’s future. In Jim Parsons’ THW rumors report of April 6, he reported that Canucks’ winger Brock Boeser would be asking for around $6 million per season on a new deal as a restricted free agent. His numbers have been good, scoring 55 points in 68 games this season, which likely would equate to a market-value contract in the $6 million per season range. 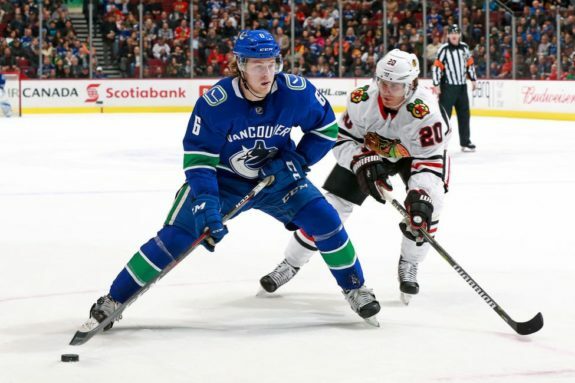 However, the issue for Canucks’ general manager Jim Benning is that Boeser has suffered a number of injuries that have limited the number of games he’s been able to play in his NHL career. “We will figure it out, whether it’s a one-year deal or eight-year deal, something is going to happen in between now and six months from now. I don’t know if there is a big rush, I would like to get it done with Jim [Benning]; that could happen in the next week or later on. We are both open to discussing all options. Overall Brock is open to anything.”That Boeser’s agent is weighing in by using the phrase “open to anything” is good news for Canucks fans. 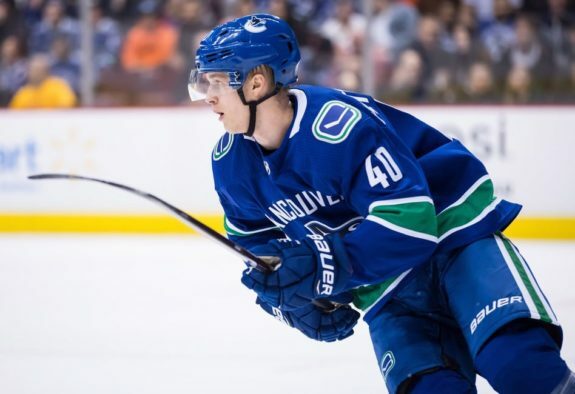 Hope for next season’s team is invested in the young stars, which include Pettersson, rookie defenseman Quinn Hughes, goalie Thatcher Demko, and Boeser. Obviously signing Boeser helps give the team a strong young foundation to build around. Furthermore, it seems obvious that Boeser wants to be part of that future. His agent has basically announced that contract negotiations won’t be painful. Now, the only question seems to be whether the deal is short-term (given his injuries) or long-term (given Boeser’s perceived value to the team). The Canucks’ luck has been bad four years in a row. However, perhaps that won’t matter much on the NHL Draft day. On Tuesday in Toronto, the Canucks went against the odds yet again and fell in the draft lottery. Although I’m sure Benning would have liked to have had the luck of the New Jersey Devils, they didn’t. Instead of moving up in the draft lottery, they moved down a spot. 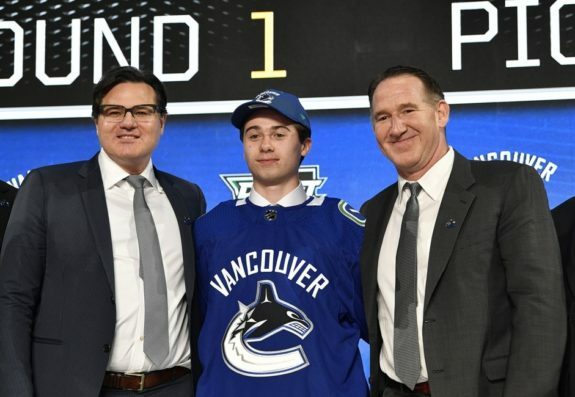 Although the odds going into the Draft Lottery were slim, the Canucks had a five per-cent chance at the first pick, which might have brought the Hughes brothers together (Quinn, who already is a Canucks player, and Jack, who’s ranked by many as the best prospect in this year’s draft). Alas, it didn’t happen. Even with an almost 50 per-cent chance of staying in the No. 9 position, that didn’t happen either. They had less than a one-in-three shot of slipping to 10th, but that’s exactly what did happen. Fortunately, the Canucks’ needs at draft day might not cause them to be disadvantaged. They will certainly get a good draft pick, and as noted in the next item, that draft pick will probably be a defenseman. Item Four: Will Victor Soderstrom Become a Canuck? After the draft lottery, TSN’s Craig Button announced his mock draft, and he had the Canucks taking young Swedish defenceman Victor Soderstrom at No. 10. As Button suggests, Soderstrom is “a right-shooting Yin to the left-shooting Yang that’s Quinn Hughes.” On Feb. 13, Sportsnet reviewed the top NHL draft prospects and noted that Soderstrom was an “uber competitive two-way defenseman” who thinks the game at a high level. Sportsnet’s review noted that he was the “complete package” and raved about his gifted skating and ability to move through all zones of the ice smoothly and effortlessly. The review suggested that Soderstrom was competitive, always wants to win, and that his vision and ice awareness allowed him to play both a “responsible” and “dynamic” brand of hockey. He also can carry the puck and has a great shot. He makes good defensive decisions, stands up well against top players, and has good hockey instincts. In short, as the review stated, “he’s a game-changer.” Sounds like he could become a good player for the Canucks. Certainly, Benning chose well at last year’s NHL Draft. It’s hard to believe, but the Canucks have been in the NHL for 50 years. Next season the team will celebrate its 50th by having a number of celebrations and festivities. These include the launch of a new alternate jersey, the special return appearance of the skate logo and black uniform (as voted by fans), and the retirement ceremony of Daniel and Henrik Sedin’s numbers 22 and 33. The Canucks first NHL season was 1970-71, when the league expanded to 14 teams. Also entering the NHL that season was the Buffalo Sabres. If the team could make the playoffs, that would only add to the fans’ celebrations. The NHL Draft will be held on June 21-22 at Rogers Place. Between now and then, the playoffs will have been completed and a new Stanley Cup champion will have been crowned. Sadly, it isn’t the Canucks’ season for that. Who knows for next season? There’s hope.